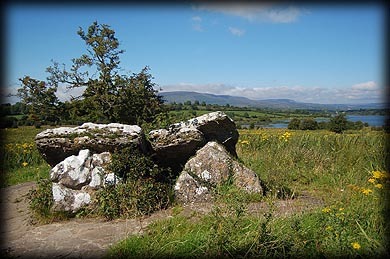 The day we visited Loughscur was one of the sunniest days of the summer, the land around this unusually low portal tomb looked rather beautiful, covered in ragwort, a yellow weed similar to daisies, with the wonderful deep blue sky reflected in the lough behind. The large capstone has cracked and split into four almost equal parts, in the image above you can see the two portal stones to the right with part of the capstone resting on them with another part of the capstone lying on the ground to the left. In the image left you can see the two low portal stones with two parts of the capstone resting on them. To the back of the tomb under the tree are two stones associated with the tomb. The monument is clearly visible from the road and even has its own parking area. It might not be the best example of a portal tomb, but is still worth a visit because of the location. Situated: In a gorgeous lakeside setting on the banks of Loughscur, County Leitrim. From Carrick-on-Shannon take the R209 north towards Keshcarrigan. After about 10 kilometres you will pass through Letterfine, Loughscur is one kilometre beyond here on your left. There is a pull in for cars and a gate with a path leading to the monument. Discovery Map 33: H 0228 0779. Last visit Aug 2007.